The Powerhouse Quintet consists of three boyhood friends who grew up in Del Mar, California, and two other great players from San Diego who were drafted to add their talents to this project. Bryant Allard, who plays trumpet and flugelhorn, left Del Mar to attend the Berklee College of Music in Boston. After college, he moved to the San Francisco Bay area and then to Portland, Oregon. He currently lives and gigs in Portland. Steve Feierabend is the group’s saxophonist. He, too, attended Berklee before moving on to Rutgers University where he earned a Masters Degree in Jazz Performance. Bim Strasberg, bassist, followed the other two to the east coast, then returned to California where he earned a B.A. from UC San Diego. He was also one of the original members of The New York Hard Bop Quintet, a group I intend to write about in the coming year. In 2000, the three principals were invited to return home to perform in a jazz concert series. It was one of the few chances they had had to play together since leaving for college lo those many years earlier. They happily discovered that their playing styles and philosophies aligned to a remarkable degree. Sometime later they returned to San Diego and put together the album I am going to tell you about, aptly named “Reunion”. The name of the group, “Powerhouse Jazz Quintet”, comes from Powerhouse Park where they performed together in their early years. “Reunion” consists of 11 songs, all but one of which were written by members of the group. The album kicks off with “The Chase” from Allard. As you might expect from the title, everyone jumps in at the beginning and you can just see the fingers flying as they race along. One by one the guys take their solos, and in a group like this it is tough to single out any one individual as being the “star”. That is because even though the album is plainly Allard’s and Feierabend’s show, the other guys are definitely not just along for the ride. Antonsen gives an outstanding performance on piano, and drummer McMahon is superb. Strasberg’s bass just keeps hitting that line, running circles around them all. Following “The Chase” is “Blue Haze”, written by saxophonist Feierabend. The pace on this one is a little slower than “The Chase”, but this is still pure bop. The guys move this one right along, meticulous and melodious, a nice lilting piece of music that moves and flows, warm and comfortable, hugging you like an old sweater on a cold winter day. “Incanto”, one of three compositions here from the pen of bassist Strasberg, is another song with a comparatively slow pace that does not keep it from bringing a warm, lively feel to you. Antonsen on piano is a standout on this one. “Rockermotion” is a nice, nimble song, the second of Strasberg’s contributions to this album. Like all great jazz, everyone has their part to play, and all acquit themselves well. This song was also recorded by Strasberg’s other group, the aforementioned New York Hard Bop Quintet. Skipping ahead to “The Clincher”, you’ll find it to be a remarkable piece of music. Written by bassist Strasberg, this song literally flies along, the energy boiling off it as it goes. Everyone gets a shot at this one, but Feierabend and his sax rule the day. Hmmm. Okay, I guess I’ll have to say Antonsen’s piano is superb also. The last song I’m going to write about here is Feierabend’s composition “Bohemian Rhapsody”. Yes, you read that right. “Bohemian Rhapsody.” Despite the name, the song presented here definitely is not Queen’s rock anthem that Freddie Mercury wrote in 1975. Unlike Mercury’s song, Feierabend’s is pure bop from start to finish, with nary an operatic solo anywhere to be heard. It is, however, a great song and a fitting conclusion to a fantastic album. You know what comes next, right? 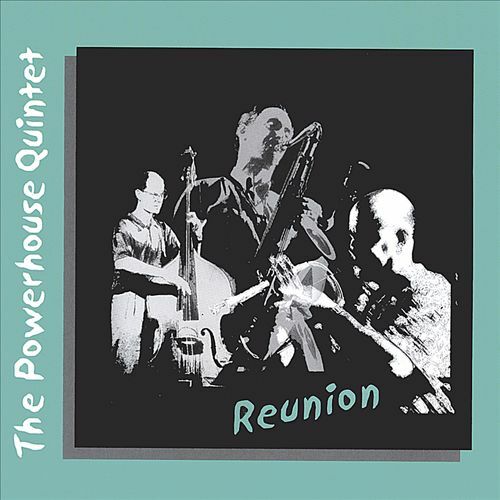 I have enjoyed listening to The Powerhouse Quintet’s album “Reunion” ever since the day in May of 2008 that it showed up in my mailbox at the radio station. I am certain that you will find it to be a superb addition to your personal playlist for a Saturday (or any other) night! For more information about the various members of The Powerhouse Quintet and their current personal projects, click the links above. “Reunion” can be purchased online at various places, including talljazz.com. Thanks for this Al and for all the posts I have so much enjoyed reading this year. Regards and best wishes for Christmas and 2015 Thom. Thanks for your kind words, Thom. I appreciate your comments. Happy holidays to you and those you care about, and here’s hoping 2015 will be a better year for us all.